When pairing beer with cheese this is an experiment that is always a worthwhile effort. This experience is enhanced when you both the beer and cheese are of top quality. These two common denominators will be met when Royale Brewing teams up with Chizu on a beer and cheese pairing entitled Royale with Chizu. Steve Jones, our local Cheesemongerer and proprietor of Cheese Bar will bring his extensive knowledge of cheese and pair this with Royale Brewing and its esteemed brewmaster Paul Rey. Royale with Chizu will take place on May 24, 2016 at 7:00pm at Chizu in downtown Portland. 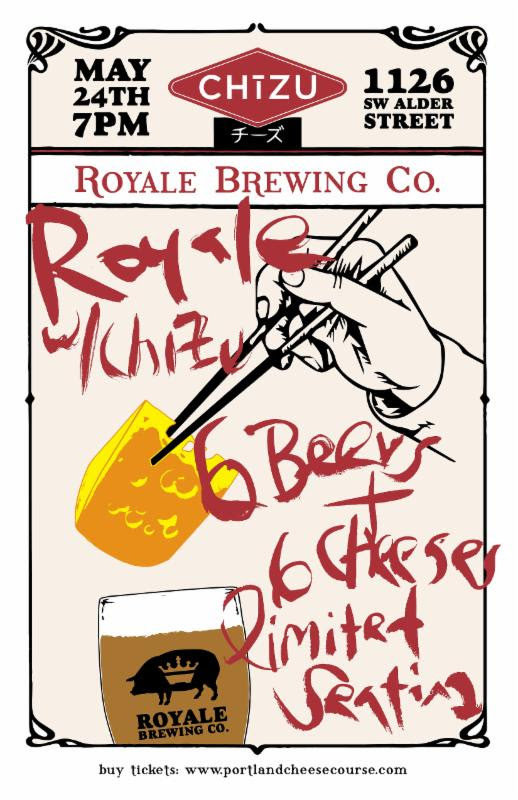 For the event Royale Brewing is pairing up with Chizu to pair 6 of their exceptional, locally brewed beers with 6 of Chizu’s favorite cheeses! Join Brewery founder, Michael Weksler and Chizu owner, Steve Jones for a great night of beers and cheeses. There will also be a special Belgium Blonde release for the event! Royale with Chizu is hosted by Portland Cheese Course. Tickets are now on sale at $45 each and can be purchased here.